Umenishiki Pilsner is 5.5% pilsner from Umenishiki Yamakawa, based in Ehime prefecture. It is part of their all-year round range though at the time of writing, it is unknown whether Umenishiki Pilsner is based on a Czech or German recipe as even the Umenishiki homepage doesn’t list any information about it. It is also an award winning beer, having won either silver or gold medal at the International Beer Competition from 2004 to 2008, and also bronze in 2009 and 2010 at the Japan Asia Beer Cup. Umenishiki Pilsner can be found both in bottles and on tap across Japan. Crisp and clean. Is it Czech or German though? Umenishiki Pilsner seems to be ubiquitous with Queen’s Isetan stores as whenever I’ve been into one in the search for Japanese craft beer, I’ve always come across this beer. Yet there doesn’t seem to be any tie-in nor any information about it being a collaborative range of beers either. Umenishiki Pilsner poured out a light golden colour that was fairly clear of any particulates or yeast sediment, and was topped off with a fluffy white head that lingered throughout drinking. It had a slightly hoppy floral aroma with an underlying level of biscuit aroma to it as well. The aromas were balanced very well and left a little bit of honey sweetness on the nose too. The body was as crisp as it looked and was very refreshing when it was cool though once it had warmed up to room temperatures, it was a tad cloying on the palate. It also had some slight bitterness to it, though faint, that come through in the aftertaste more than in the body. It didn’t blow me away but it was a good beer to finish off the day. 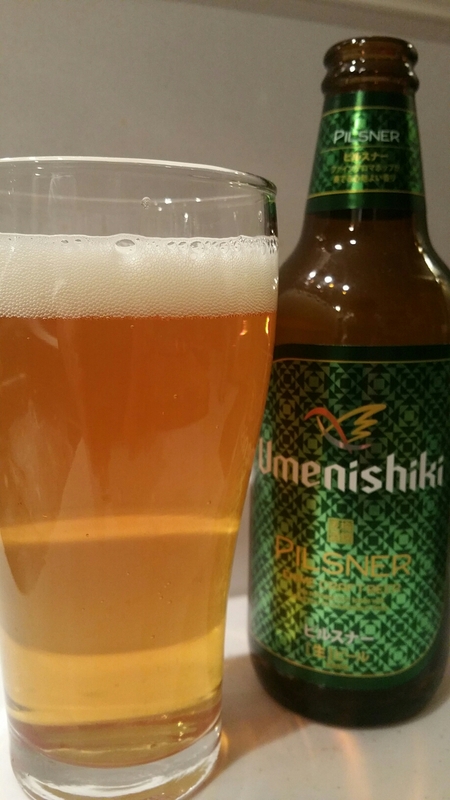 Umenishiki Pilsner is a nice beer that is a good alternative to the mass-produced pilsners on the market.